Everyone in the motion picture Blood Diamond wants to get out. The desire to escape the hell that Sierra Leone was in the late 90s is overriding. 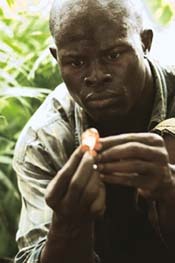 Whether it is Captain Poison (David Harewood), a leader of the guerrilla army, Revolutionary United Front (ruf) or Danny Archer (Leonardo DiCaprio), a diamond smuggler or Solomon Vandy (Djimon Hounsou), a fisherman forced into diamond mining by the ruf, everyone is looking for the ticket out. And for all these men and more, the ticket is in the shape of a priceless pink diamond, the size of a bird's egg. But for them, it's the shape of their dreams. The Warner Brothers release is set against Sierra Leone in the 1990s, ravaged by a civil war, which is fed by diamonds which are smuggled across the border via Liberia to be sold to European buyers. These blood diamonds, or as these stones have come to be known, serve as the currency the ruf uses to arm itself. Filled mostly with forced child soldiers, the ruf controls most of the diamond mines in Kono district. Ticket to freedom Archer's first encounter with Vandy is in a jail, where Archer learns of the prized diamond that Vandy ferreted out in the mine and hid it before Poison could get his hands on it. Archer and Vandy are pitted both against and towards each other in the nail-biter of a race to the diamond or their death. And hence begins the battle of trust between Archer and Vandy. Archer, for whom the diamond is a way out of Africa, and Vandy, who is desperately searching for his family in the torn country and the diamond again is his only insurance for their safeguard, are both unwilling comrades in the race. Vandy can get Archer to the diamond and Archer has the resources to guide Vandy to his family. The third variable in the delicate equation between Archer and Vandy is Maddy Bowen (Jennifer Connelly), a journalist from New York, who singles out Archer as the main peg to her blood diamonds story. The vicarious seeker Armed with dubious means to get to her story, Bowen is justifiably held in disdain by Archer. As Archer puts it, Bowen is a part of the flighty flock of vultures that gathers in crisis zones armed with their laptops, mineral water and hand sanitisers. But Bowen's character is contradictory. She appears to be a hardened war veteran but is equally tormented by the ways reporters manipulate and feed upon the horror and suffering in war zones. But Bowen is not beyond the predilictions of her ilk. At the war ravaged-area, she gets busy clicking pictures of sobbing mothers clutching disemboweled infants to their chests or of a howling Vandy, who catches a glimpse of his family in a refugee camp only to learn that his son has been kidnapped by the ruf. Archer's irreverence towards the brethren of journalists, which is pointed towards Bowen makes sense now. The sarcasm is, however, soon lost as the film itself employs the same techniques its protagonist criticise stereotypical visuals of the African backdrop replete with unbelievably inhuman misery in the shantytowns and villages contrasted with shots of the stupendous landscape of the country. The film abounds with clichs technically competent and grippingly paced, the film is undoubtedly gut-wrenching. But the message is garbled sometimes it seems that this an issue with a story built around it, and not the other way round. The film does have more than competent performances. Archer is a reluctant hero. Typical of films directed by Edward Zwick (The Last Samurai and Glory), Archer is also slowly edged towards redemption despite his characterisation. Despite his devious and calculating ways, the hardened and unprincipalled smuggler finds a friend in the unassuming Vandy, who serves as the means to his final release. DiCaprio has come a long way since Titanic. He adeptly depicts Archer as the ex-mercenary, who is desperate to get out of the hell he has helped create himself. Honsou gets some of the film's most brutal scenes and does a very creditable job at that. But Connelly has a throwaway role. The script deprives her of a fairer share of screen-time as she is abruptly picked out of Sierra Leone and sent away to sip a coffee in a world where diamonds are a girl's best friend. Diamonds are glamourous for sure but not the only example of western exploitation of third world countries' natural resources. There is gold, there is ivory, or even timber, which have fuelled civil wars across countries in equally, if not more, sly subversive ways. In fact in the film, a stunned villager, overcome after his whole village is razed to the ground by the ruf, puts the predicament of her people succinctly "I hope they don't find oil here." And if that were the case, another war would be created to get in. Not to get out.